Northern Illinois University is hosting its eighth annual Graduate and Professional School (GPS) Fair on Tuesday, Oct. 4, from 10 a.m. to 2 p.m. in the Duke Ellington Ballroom of the Holmes Student Center. The fair is free to all and is intended to help students get a head start on their searches for master’s, doctoral or professional degree programs. “On the continuum of student career success, pursuing a graduate or professional degree is often the next logical step for entry or advancement in the workplace. That is true because the great promise of graduate education is that it prepares the next generation of thought leaders, innovators, and practitioners for those roles,” noted Bradley Bond, dean of the Graduate School and associate vice president for Graduate Studies. NIU graduate and professional programs are well-represented at this year’s GPS Fair, including the Graduate School; the Colleges of Education, Health & Human Sciences, Law, and Liberal Arts & Sciences; the Department of Public Administration; the Department of Finance/M.S. in Financial Risk Management; and the NIU MBA program. According to the nationwide 2016 Student Survey conducted by the National Association of Colleges and Employers, 25 percent of graduating seniors (5,600 respondents) planned to continue their education after earning their bachelor’s degrees. 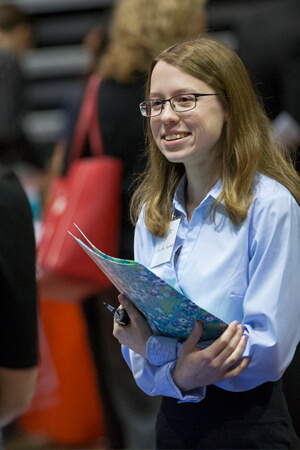 “Graduate or professional degree programs represent an opportunity for students to broaden and deepen their professional skills and interests, thus adding tremendous value to what they bring to the workplace,” said Joyce Keller, associate director of NIU Career Services and coordinator of the event. Attendees will have the chance to talk face-to-face with graduate and professional school representatives from over 100 programs throughout the United States. The fair includes exhibitors from law, technology, health, business, education, sciences, social sciences and humanities programs, among other areas of study. Although attendees do not need to dress professionally or bring copies of their résumés, it is recommended that they prepare by reviewing the list of schools and programs scheduled to attend the fair. The growing list of exhibitors for this year’s GPS Fair is available at gpsrecruit.niu.edu. Students are encouraged to consider advanced degrees early in their college careers. Gathering program information early will help students plan for admissions requirements and funding. Students are invited to visit Career Services to discuss how graduate and professional programs may help them advance toward their career goals and further develop their interests, priorities and talents. To schedule an appointment with a Career Services staff member to discuss graduate school planning, students may call 815-753-1641 or email careerservices@niu.edu. To see additional information about the Graduate & Professional School Fair, please visit gpsrecruit.niu.edu.